Call me contrarian. As much as I enjoy reading about new year priorities in December, I'm able to internalize and focus on them only in the new year. That mindset makes reading Content Marketing Institute's article titled What is Your Content Marketing Priority? 22 Experts Share Their Goals for 2012 that much more interesting and relevant. 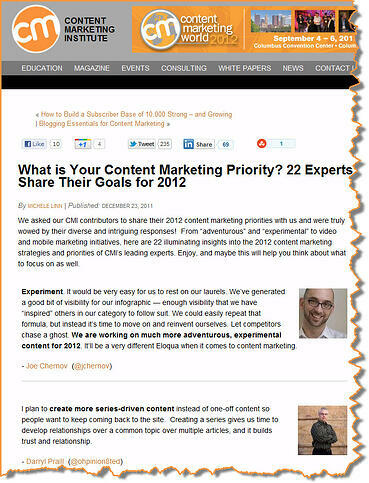 Here, then, are 22 content marketing priorities to help inspire and focus you as you get fully immersed in 2012! Joe Chernov says to experiment. Darryl Praill is planning for more series-driven content. Ahava Leibtag plans to find the voice that is true to each of her clients. Jason Falls intends to develop more effective Twitter and Facebook calls to action. Doug Kessler has in sight iPad tablet content and B2B mobile. Scott Aughtmon has four priorities for 2012. My favorites: create content outside of your default content zone and expand your personal brand with more behind-the-scenes content. Joe Pulizzi is desperate for more examples of businesses using content marketing! Please, let's help him out! Jessica Eastman will be creating a content communication strategy. Sarah Mitchell is focused on diversity of content - including infographics, video content and original photography. Arnie Kuenn says his focus is on video! Heidi Cohen re-affirms the importance of tyeing content marketing to key business objectives. Nate Riggs plans on connecting content marketing to real life customer touch points. David Huffman intends to introduce 'news jacking' to stay front and center of fresh, breaking news. Katie McCaskey remains intensely focused on small business content marketing strategies. I'm delighted to learn how her business used Facebook to help build customer engagement. Tom Pisello reminds us how important it is to produce and deliver content that helps facilitate the buyer's journey. Michael Kolowich intends to reimagine the webinar experience using Skype or Google+. Manya Chylinski will be delving into 'community'. Anna Ritchie wants to integrate the content created in 2011 into 2012's priorities. Russell Sparkman details aligning content marketing with audience types and needs as well as goals. Will Davis will emphasize how important it is to map content to buyer roles, stages, actions and objections so content helps drive revenues. Toby Murdock wishes that content marketing have process to drive results. My priorities for 2012 have to do with inspiration from Ardath Albee [see Storytelling in Business: Ardath Albee & Contagious Content] and the importance of melding personas and the buying cycle. What's on your 2012 radar screen? What do you intent to accomplish in 2012 with your content marketing?